Dwell on Design attendees and Dwell readers may be savvier than the average consumer about water consumption. But did you know that a low-flow toilet reduces energy usage (aka a carbon footprint), too? TOTO's Bill Strang will join us at Dwell on Design to talk facts and figures on carbon and water, with real-life recommendations for saving money on your water bill and shouldering responsibility for our planet. A very big focus for the company has been streamlining its energy usage and internal operations in order to keep costs low, and therefore retain American industry. 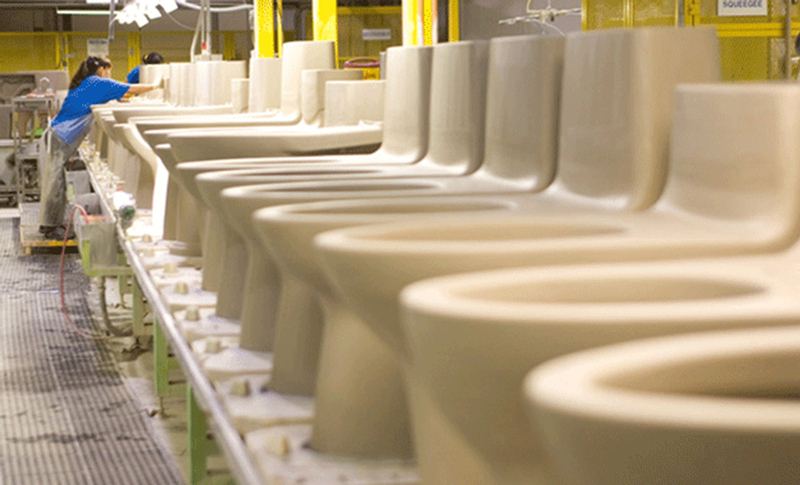 TOTO's Atlanta factory employs around 500 workers and produces 22,000 toilets per month. They can make a toilet in three days from start to finish—a process that's so relatively quick Strang describes it as "bakery fresh." After analyzing the carbon output of every step in the manufacturing process, the company was able to reduce the carbon content of a porcelain toilet by 25%. And they didn't stop at the manufacturing level, either: Under Strang's leadership, TOTO has explored several channels for discarded porcelain. They now use crushed porcelain in road paving, and have formed an alliance with Crossville Tile of Tennessee, who uses the crushed porcelain as feed stock to make porcelain floor tile. They've even looked into using castoff porcelain chunks to line stripped oyster beds! In a more commercial case study, the Hartsfield-Jackson Atlanta airport converted its standard toilets to TOTO 1.28-gallon toilets in 2010, which has saved 3.7 million gallons of water per month. With almost 130,000 passengers going through the airport each day, this volumetric difference pays big dividends. per day). The airport's electricity output has been reduced by 13,600 kilowatts per month, which means, roughly, that 22,000 pounds of carbon have NOT been emitted into the atmosphere. These are but a few of the fascinating tidbits Bill Strang has to share about the water cycle and TOTO's mission of "People, Planet, Water." Come on down to the Sustainability Stage on Friday, June 21, at 3:00 pm to hear Strang's compelling presentation. This article was originally published on May 7, 2013 on our sister site, Dwell on Design.